Sumptuous grilled king prawns served with buttered mixed vegetables and lemon butter sauce. You can also serve it with steaming rice. This can be cooked on any occasions specially this summer time where many are unwinding by going to the beach or resorts. 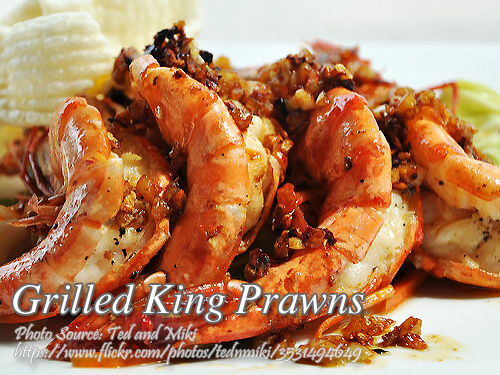 To cook grilled king prawns; Wash and clean prawns by cutting the antennae and rostrum (beak). With the shell still on, make a slit on the back, devein, and open up to a butterfly. Season with salt and pepper. Brush prawn with olive oil and grill over charcoal until cooked. For the lemon sauce; combine butter, lemon zest and lemon juice. Stir very well then add parsley. For the buttered vegetables; heat butter in a pan then stir cook mixed vegetables for 3 minutes. Season with salt and pepper. Serve the grilled prawn with lemon butter sauce, buttered vegetables and steamed rice. Wash and clean prawns by cutting the antennae and rostrum (beak). With the shell still on, make a slit on the back, devein, and open up to a butterfly. Season with salt and pepper. Brush prawn with olive oil and grill over charcoal until cooked. For the lemon sauce; combine butter, lemon zest and lemon juice. Stir very well then add parsley. For the buttered vegetables; heat butter in a pan then stir cook mixed vegetables for 3 minutes. Season with salt and pepper. Serve the grilled prawn with lemon butter sauce, buttered vegetables and steamed rice. Recipe is simple and easy to follow, I will definitely try it.